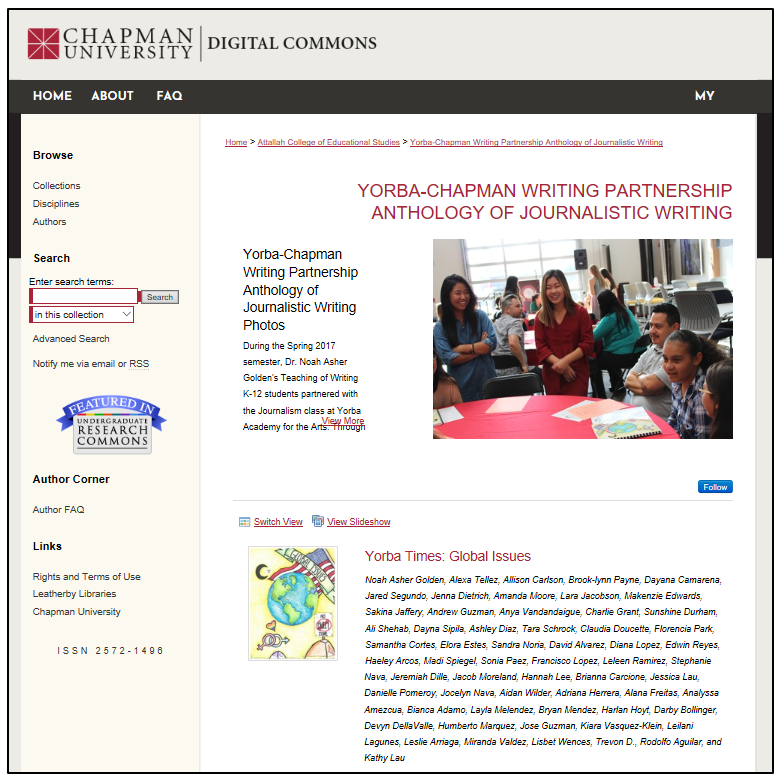 The Yorba Times, a unique online publishing partnership at Chapman University, has become a valuable teaching tool as junior high students write for and undergraduate students teach to real audiences. Chapman University undergraduates enrolled in Professor Noah Asher Golden’s Teaching of Writing K-12 learn exactly what they can expect as future educators during a 4-month partnership with local journalism students. Together the students create a series of features, editorials, and news articles related to student-chosen issues. Golden stresses that having an authentic space for publishing informs the writing process: junior high students work more seriously knowing that the journal will be public. They enjoy the opportunity to showcase their hard work online, and to share it during a year-end presentation on Chapman’s campus. They’re no longer writing for their teacher or for a grade, but to share their knowledge. For the undergraduates, having the Yorba Times publicly available is an invaluable way to demonstrate their teaching experience in their student portfolios and for potential employers. This partnership gives Golden’s undergraduates a variety of ways to engage more deeply in their own learning. His students have to become intimately familiar with the writing process in order to mentor the younger students through the process of writing, editing, and producing the magazine. As the junior high mentees produce their work, the undergraduate mentors see the educational and social impact they make on the younger students, gaining a glimpse of the rewards of teaching.